buy Italy vs France tickets ? 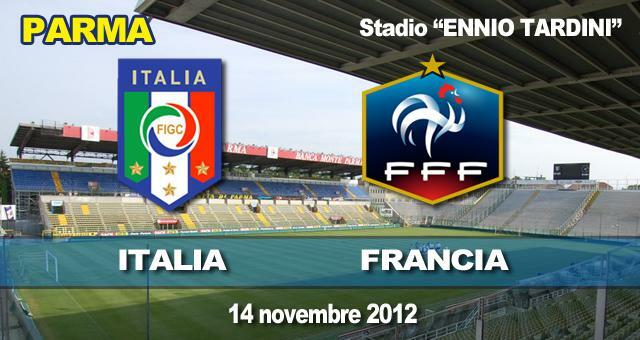 Italy will meet France on Wednesday November 14th 2012 at Stadio Ennio Tardini in Parma for an international friendly match, kick-off 8:50 CET. The latest Azzurri’s game scheduled in Parma on May 29th 2012 ( international friendly Italy vs Luxembourg) was called of because of the Earthquake in Emilia. Italy vs France will end the surprising year’s campaign of Cesare Prandelli’s side runners-up of UEFA 2012 European Championship hosted by Poland and Ukraine. According to the lastest edition of the FIFA World Ranking Italy is at 5th place and France at the 18th. Current match of italian national football team is the 6th ever played from Gli Azzurri in Parma, the 14th of the year and the 38th played against Les Blues. – from Parma airport, take the orbital road towards downtown, exit in Via Mantova and then turn right in Viale Partigiani d’Italia. from Parma railway station: take Viale Mentana, then Viale S.Michele till you reach a round area where you turn left into Viale Partigiani d’Italia. At the parking area at A1 motorway exit, a bus service can be found for the benefit of the fans coming from Parma sorrounding areas.